Mother Teresa was born in Skopje, Macedonia, in the year 1910. Little is known about her early life but at a young age she felt a calling to serve through helping the poor. At the age of 18 she was given permission to join a group of nuns in Ireland. After a few months of training Mother Teresa travelled to Calcutta, India where she formally accepted the vows of a nun. In her early years she worked as a teacher in the slums of Calcutta, the widespread poverty made a deep impression on her and this led to her starting a new order called The Missionaries of Charity. The primary objective of this mission was to look after people, who nobody else was prepared to. The Missionaries of Charity now has branches throughout the world including branches in the developed world where they work with the homeless and people affected with AIDS. In 1965 the Society became an International Religious Family by a decree of Pope Paul VI. She felt her simple philosophy was to serve others with love. At around this time the life of Mother Teresa was first brought to wide public attention through a book by Malcom Muggeridge who wrote a book and produced a documentary called ‘Something Beautiful for God’. Mother Teresa was committed to serving the poorest and downtrodden around the world, but especially in her adopted India. She was deeply religious and a devout Catholic, however, she did not believe in converting people, instead she felt her mission was to bring people closer to God, in whatever religion they followed. There is only one God and He is God to all; therefore it is important that everyone is seen as equal before God. I’ve always said that we should help a Hindu become a better Hindu, a Muslim become a better Muslim, a Catholic become a better Catholic. 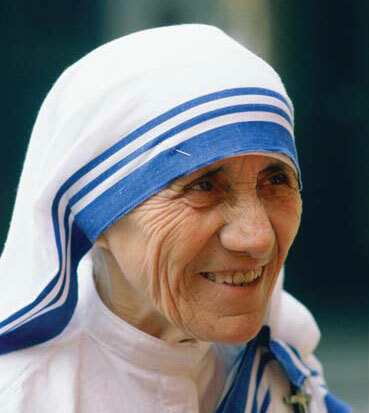 Mother Teresa was awarded the Nobel Prize “for work undertaken in the struggle to overcome poverty and distress, which also constitute a threat to peace.” She refused the conventional ceremonial banquet given to laureates, and asked that the $6,000 funds be given to the poor in Calcutta.